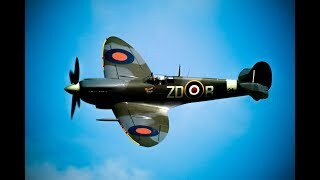 WW2 Aircraft is a collection of recordings of rare World War 2 aircraft. It features icons such as the Supermarine Spitfire, Bucker Bu-131 Jungmann, North American P-51 Mustang, Curtiss P-40 Warhawk, Grumman F8F Bearcat and others. The library consists of 59 recordings ranging from 13 seconds to over 10 minutes in length. The sounds have been recorded with the Sennheiser MKH416, MKH8040 and the Sony PCM D100. The library covers exterior flybys from slow to very fast, aircraft taxiing by, engines starting up, idling, revving, stopping and a few takeoffs. It also includes an on-board recording of a Bucker Bu-131 biplane as it starts up, taxies, takes off, flies, lands and then stops. The planes have been recorded at a variety of distances, from close to relatively far away. As an added bonus, one of the P-51 Mustangs recorded had had its guns removed, which caused an awesome whistling sound every time it swooped down at a certain angle. Categories: Aircraft - Jet/Propeller Planes, Vehicles. The sounds are very full and dynamic. I honestly think this library is under-priced. It is a big value for the money spent!